The global Red Cross network and the Malagasy Red Cross responded to Cyclone Enawo, which made landfall in northeastern Madagascar on March 7th. With wind speeds equivalent to that of a category 4 hurricane, Enawo was the strongest cyclone to impact the country in the last 13 years. Much of the nation’s roads are dirt, and due to rains and flooding, reaching the most heavily impacted areas was made extremely difficult. Unfortunately, in the event of a cyclone, there is often a delay in providing quality post-event imagery due to cloud cover. Through their Open Data Program, DigitalGlobe was able to provide a number of both pre- and post-event imagery in the days following the storm. The most heavily impacted areas in Madagascar are rural and as is often the case, reliable geospatial data can be difficult to obtain. By utilizing OpenStreetMap and the Humanitarian OpenStreetMap Team’s Tasking Manager, this imagery was used to trace buildings and roads in order to improve the quality of data available on OpenStreetMap. With over 200 contributors, nearly 40,000 buildings and 1,700 km of road were added to OpenStreetMap. The imagery also provides a relevant situational update for operations planning. In this case, the imagery was able to supplement accounts from these communities providing context to flooding and its proximity to the communities. The attached map shows buildings and roads that were added to OpenStreetMap with this imagery, in the port community of Maroantsetra. 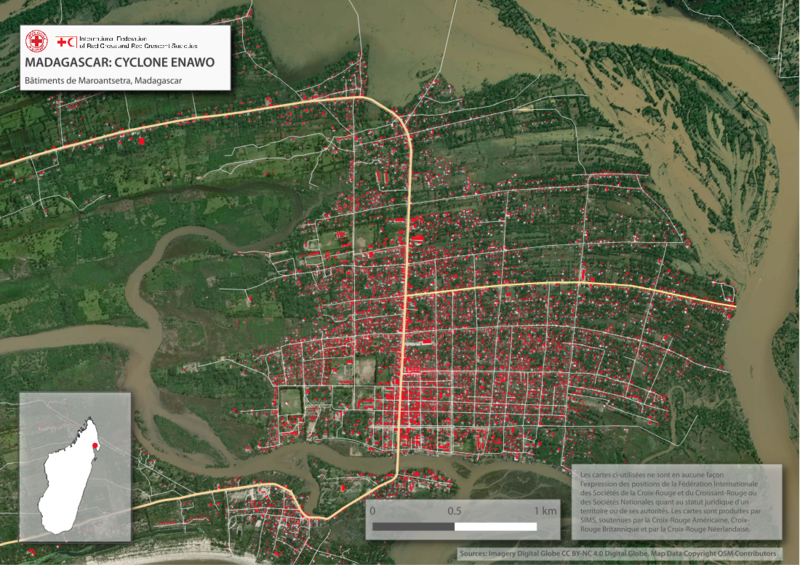 The imagery also allowed for a more complete road network to be traced into OpenStreetMap, through the efforts of dozens of volunteers, ultimately providing data not only for the Red Cross in this disaster response, but also for communities and other organizations in the region.